The North Atlantic Current of the Gulf Stream keeps Heir Island’s climate warm and mild with wet winters. Together the rain and the mild temperatures support a lush and varied flora on the island that is almost tropical. 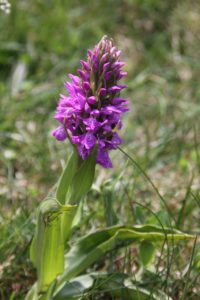 There is a tremendous amount of flora to be found on Heir Island, and some species are nationally rare. For those interested in ornithology, the island is also an ideal home and stopover site for many species of birds. Heir Island, along with the other islands of Roaringwater Bay, is a Special Area of Conservation (SAC) as designated by the National Parks and Wildlife Service (NPWS) and is considered to be important on a European as well as Irish level. 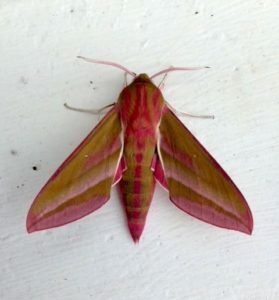 The Heir Island Wildlife Project, founded in 2017 by a group of Heir Island residents, works to raise awareness on issues surrounding nature conservation and biodiversity both on the island and in the sea through information and education. Every month, it publishes a guide on the island’s flora and fauna. 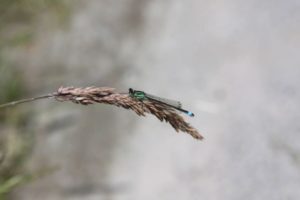 From time to time, the Heir Island Wildlife Project also hosts special events that are in line with its goals and objectives. 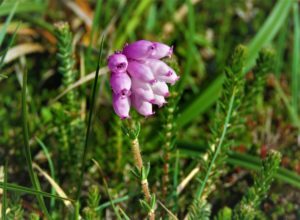 Cross-leaved Heath found on boggy acid soils. Heir Island is a haven for flora, with an astonishing number of wildflowers to be observed along its boreens. Some plants on the island are found in very few places in the world. 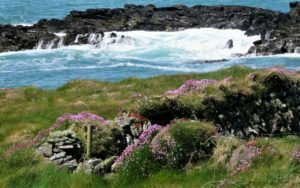 According to the book The Wild Plants of Sherkin, Cape Clear and the Adjacent Islands of West Cork, published in 1996 by Sherkin Island Marine station, a total of 592 flowering plants, conifers and ferns have been recorded on the islands of Roaringwater Bay. This makes this small area the richest 10-kilometre square in Ireland. 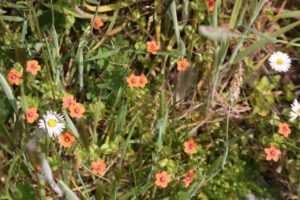 Twelve Irish Red Data book species, over 30 significantly rare Irish plants and several taxa new to the Irish flora have been recorded. Of the total found in Roaringwater Bay, 381 species are found on Heir. On nearby islands, 241 are found on East Calf, 227 on East Skeam and 167 on West Skeam. 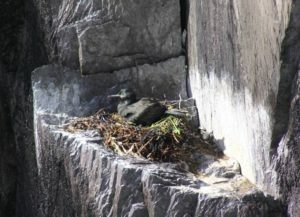 Shag in nest on the cliffs of the Dún. 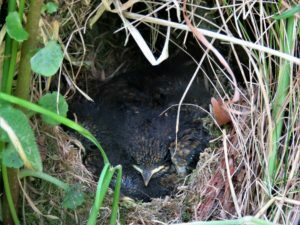 A robin’s nest only two feet above ground in a ditch. The island is an ideal home for birds, because of the amount of uncultivated land and the preservation of most of the hedgerows. On the western side of the island, where there are panoramic views over Roaringwater Bay, one can observe cormorants, shags, herring gull, lesser black-backed and great black-backed gulls in action. By the cliffs of the Dún, there are the nest sites for shag, kestrel, raven, rock pipit and chough. On rocky shores, one can find waders like the oystercatcher, common sandpiper and curlew. The grey heron can be seen from the beaches, and an occasional cuckoo and pheasant can be spotted or heard. 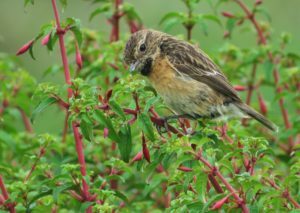 The island is also an ideal breeding ground for the meadow pipit, wren, dunnock, robin, stonechat, blackbird, thrush and linnet. 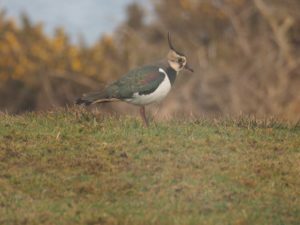 A Northern Lapwing, or Green Plover, foraging for food after Storm Emma. 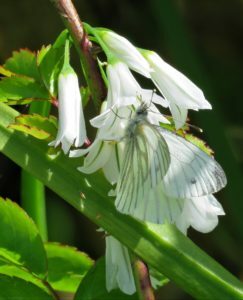 A Green-veined white on Three-cornered Garlic. There are lots of opportunities to spot migratory butterflies and other pollinators. Amongst the butterflies, the most common species that can be seen are Common Blue, Speckled Wood, Peacock, and Painted Lady. The common seal and the grey seal are common in Roaringwater Bay. Occasionally, otters can also be seen. This area is also one of the most important breeding and feeding grounds for whales and dolphins. There are reputable companies running whale watching tours out of Baltimore, and if you are out in your own boat, it is highly likely that you will spot a pod of dolphins. There never used to be foxes on the island until about twenty years ago. The foxes would most likely have swum the short passage from the mainland in search of new territory and food sources, which were more abundant years ago when the island was fully populated. Here is a video shot on Heir Island featuring an encounter between a fox and a calf.